The full list of sample job interview questions you'll most likely be asked with the best interview answers to get you hired. The candidate who is best prepared for the job interview is the one who is most likely to get the job. All the different types of interview questions are listed here including the 7 most common interview questions, difficult interview questions, behavioral interview questions and job-specific questions. Go through each list of job interview questions then click on the link to view the recommended interview answer guidelines and sample interview answers that will help you succeed in your job interview. These are the 7 questions that get asked in almost every job interview. What do you like about this job opportunity? What are you goals for the next five years? Prepare thoroughly for these standard interview questions. 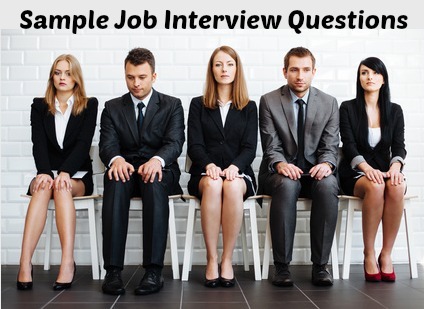 Use the sample interview answers for each of these general interview questions to help you. Remember to use the sample answers as a guideline and to prepare your own answers relevant to the job opportunity. These sample job interview questions are not always asked in job interviews but they occur frequently enough that you should prepare for them. What do you like/dislike most about your current/last job? How would you describe your manager or supervisor? How do you define success in your current/last job? Get help preparing for these at typical interview questions and answers. Sample job interview questions the interviewer is likely to ask include specific questions that reveal how much you know and understand about the job opportunity. Your interview answers to these questions provide a good indication of how much research you have done on the job, company and industry. What skills do you consider most critical to this position? How is your experience relevant to this job? What have you learned about our company? How you go about preparing for a job interview is key to successfully answering these sample job interview questions. Find good interview answers for these tough interview questions. These questions evaluate your motivational fit with the job opportunity. Not only do candidates need to be able to do the job they need to be willing and motivated to perform the job. Show how your strengths and interests are in tune with this particular position. Find out how to define your strengths and what are your strengths. What sort of work environment do you thrive in? Focus on your adaptability and willingness to learn about and work in different environments. Avoid listing specific requirements. Highlight general qualities that most working environments offer in some form or other such as challenging tasks, fast work pace, working as part of a team, the opportunity to learn, the opportunity to work independently and use your initiative and judgment. What work situations stimulate and inspire you? Your interview answer should be compatible with what you are likely to encounter in the job you are interviewing for. Look at the job requirements and focus on what will interest you. Will you be required to solve problems, deal with a diverse group of people, manage customers, contribute to team objectives, meet deadlines? Sample job interview answers for interview questions about motivation. Most job interviews today involve a number of behavioral-based questions. These questions require you to provide an example of a previous real-life situation where you demonstrated the specific behavior or competency necessary for successful performance in the job you are interviewing for. These sample job interview questions are asked to assess how you react to unexpected, off-the-wall type questions. Which five famous people would you invite to dinner? If you won the lottery what would you do with all the money? These are sample job interview questions for specific job-types. Are you interviewing for a management position, an accountancy job, a sales opportunity or a teaching job? Find sample interview questions and answers for these jobs and many other job types at the job interview guide. Be well equipped to handle any illegal interview questions you may be asked in your interview. Have a list of good questions ready to ask in your interview. Questions to ask the interviewer about the company, the job and management. Use the search box below to find any other help and advice you want on job interviews.